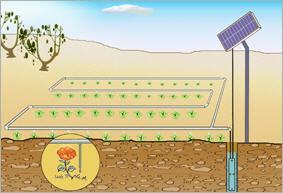 The Micro Drip irrigation system can achieve enormous water savings for the irrigation of large areas. With this innovative technology, originating from Israel, plants can absorb 80% of water, but with conventional methods 70% of water is lost through evaporation or drained away. Thus ground areas in dry regions can be used in a more economical and ecological efficient way. Through the methodology of targeted water distribution it has been proven that a more fruitful harvest is achieved over conventional irrigation systems e.g. flooding, furrows. Due to the complexity of a Micro Drip irrigation system, it has been only applicable for large investment projects and mono plant growing. For small areas such as family gardens or roof greenings, there has never been a satisfying solution. The LIUJIA Solar pump offers a new solution by using renewable energy. The pump works with a piston technology, has a small radius of 5.3cm and a length of 56cm. To power the pump it only requires a small solar panel of max. 13 Wp, but a water volume of up to 90 liters per hour can be delivered. The pumping height can reach 30 meters and a max. pressure of 3.0 bar can be achieved. This differs according to pump types (LJ1012, LJ2012, LJ3012), a LJ1012 is suitable for a pumping height of 10 meters with 1.0 bar water pressure. Depending on local conditions such as sun intensity, water resources, soil structure and plant type, an individually designed irrigation system can be created. The planning of an open system is relatively simple and is easily extendable or movable. Due to its high flexibility it can be transported and installed quickly at a site in case of emergency e.g. natural disasters. Afterwards de-installation and storage of the whole system, e.g. over winter, can be carried out without any hassle. The innovative part of this user-friendly irrigation system is that it is based on a clear and simple concept - the pump is directly connected to the water pipe. This means that experimenting with irrigation is absolutely possible as areas in need of watering, have requirements, which change case by case. Often watering needs to be tailored to plant types, weather, soil structure etc., thus this system can be adjusted exactly to address these needs. Especially family farms in remote areas can, depending on soil structure, use this irrigation system to plant higher quality plants and crops to increase their return on investment.